When I turned the key in my van recently, the engine turned on but so did my check engine light. This wasn't the first time it lit up, but it had been a while. I had somewhere to be, so I told myself it probably wasn't anything serious and kept driving. Several days later when the check engine light caught my attention again, I dismissed my concern yet told myself to remember to check it out when I got home, or at least mention it to my husband. He has the tools to diagnose the problem. In my busyness, I continued to ignore the warning light. 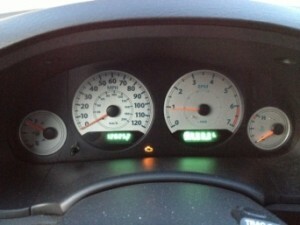 I began to think about the other warnings and gauges on my dash. The fasten seat belt light always gets heeded - for safety and to shut off the annoying beeping. When the gas gauge heads toward empty or the gas light comes on, I head for the gas station ASAP. I generally watch the speedometer pretty closely - for probably obvious reasons. Then my thoughts wandered to the warning signs and signals in my life and my journey of faith. Generally, much like the gas gauge, when I'm hungry - I eat. But what about when I'm feeling tired and I rush to a caffeine source rather than adjusting my schedule so I can get more sleep? Or I hurry past my Bible or skip exercising because my day is too busy? Or I fail to notice my soul's weariness and the need to find some quiet with God to refresh my soul? Ignoring these warning signs can limit my ability to live life fully - and can have ripple effects beyond just me, to my family, my friends, to my community. I have found the Reviewing My Days map to be a wonderful tool and invitation to notice and pay attention to things I might otherwise miss. It walks me through a series of questions looking at the "dashboard" of my life. Asking these under the loving gaze of God helps me stay aware of the warning signs and signals. Turns out, the check engine light was warning me that the gas cap wasn't sealed tightly enough. Not checking it sooner was risky though; someday it could be alerting me to a more significant problem. Ignoring the warning in my body or spiritual life is risky as well because it could keep me from living the abundant life God offers. Are there warnings or signals trying to get your attention? How might God be alerting you to your need for Him? What is one practical way you might choose to stay aware of the details of your walk with God? "Lord, help me pay attention to the warnings and signals in my life. Help me to respond to them intentionally so I may stay connected to you. Thank you for the ways you invite me into deeper relationship with You."